Automatically recognize faces in 1000s of photos and process images based on face detection results! Use over 130 Actions and Filters like resize, crop, brightness, contrast, sharpen, sepia, etc. Enhance your photos with noise removal, anti-blur, dynamic contrast. 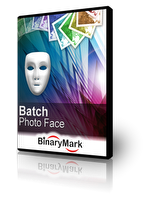 Convert to/from and save results in any of 30+ image formats. Add dynamic text and picture watermarks. Work with layers and blend modes. Edit EXIF and other meta-data, and more! Face Recognition Runs On Your Computer! Face detection does not require Internet access!